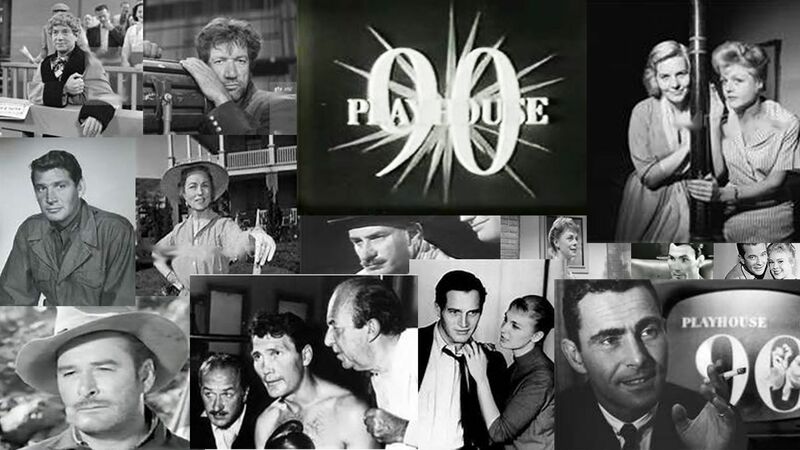 Here's where to watch every episode of Playhouse 90 season 1. Mouseover or tap an episode to see where to stream it. Click or tap the play icon to stream it on the best available service. Forbidden Area Oct 4, 1956 Heston stars as a one-eyed colonel intent of solving the mystery of the exploding bombers. Soviet agents have infiltrated a secret air base and are busy doing away with American aircraft. Requiem For A Heavyweight Oct 11, 1956 A professional heavyweight boxer (Palance) is burned out after fourteen years in the ring. When during his last fight he is sold out by his devious manager (Keenan Wynn), he struggles to find new meaning in his life. Sizeman and Son Oct 18, 1956 Sizeman owns a dress-manufacturing business in New York City. When his son was born, he addded the words ""and Son"" to the name of the company, hoping that they would work together some day. Then the son returns from the Korean War a changed man. Regarding himself as a savior of the common man from the greed of the bosses, he disrupts the happy working atmosphere at Sizeman and Son's. Rendezvous In Black Oct 25, 1956 The unexplainable death of a young man's fiancee while waiting for him on a street corner sets off a series of seemingly unrelated murders in the city. The Country Husband Nov 1, 1956 After a close brush with death, a businessman intends to live each and every day to the fullest without regard to his wife and child. When he falls for the babysitter he considers running off with her but returns after a lot of soul-searching to his wife who forgives him. The Big Slide Nov 8, 1956 When a second-rate vaudeville comic becomes a silent movie star, the conflict between his love for an actress and the demands of his career brings tragedy and heartbreak to the clown. Heritage of Anger Nov 15, 1956 Industrial mogul Eddie Hanneman finds that his two sons are uninterested in taking over the family business though they want the rewards. Eloise Nov 22, 1956 Eloise was a little girl who lived in the Plaza Hotel in New York. A memorable sequence involved her ordering one raisin from room service for her tiny pet turtle. The entire play was hilarious. Confession Nov 29, 1956 After the death of a wealthy community leader, a reporter is preparing a series on his life. When he interviews the deceased's son and daughter, they are withholding information from him. Investigations get dangerous when attempts on his life are made. The deceased's valet reveals that a letter was left which contains evidence of the politician's participation in a public swindle. Made in Heaven Dec 6, 1956 A married couple get into a petty quarrel that leads to their separation, after which the wife entertains a handsome European from the cocktail party and the husband begins to fall for an attractive stranger. Sincerely, Willis Wade Dec 13, 1956 Wealthy mill owner, Henry Harcourt, finances the college education of a poor but ambitious boy, Willis Wayde. The young man is in love with Bess, Harcourt's daughter. The Family Nobody Wanted Dec 20, 1956 Carl and Helen Doss, are unable to have children of their own, so they wind up adopting several youngsters of mixed races. Massacre at Sand Creek Dec 27, 1956 A drama set in 1860s Colorado about the tragically manipulative ways of a U.S. Army colonel who forces the Cheyenne to fight a battle they want to avoid. Seeking fame and the rank of a general, the self-serving colonel drives the Cheyenne warriors into an unprotectable region known as Sand Creek. Despite the efforts of a young U.S. soldier intent on saving them, the Indians were massacred. The Ninth Day Jan 10, 1957 After World War III a small group of people live in the desert. A young man rebels against the group and tries to run away, hoping to find other communities of survivors, but is told by the elders that he must stay and marry the group's only young woman. The Star Wagon Jan 24, 1957 Story about a timid inventor who works for an exploitive boss and spends company time collaborating with his boyhood friend on a time machine. When the boss fires the inventor and orders the machine destroyed, the two friends decide to go back in the machine to 1926 when they were young and full of dreams. The Miracle Worker Feb 7, 1957 The episode retells the first encounter of Annie Sullivan and young Helen Keller, unable to hear or see since the age of two. It was later remade for theatrical release. The Comedian Feb 14, 1957 Sammy Hogarth has reached the top of his profession as a TV comedian. But though his audience loves him, his co-workers hate him. They know him as an egotistical, petty tyrant. What keeps them from quitting is money--his salaries are the best in the business. Hogarth's head writer is Al Preston, and Al is in a jam. He has run out of ideas, can't think up anything Sammy will accept for the next show. In fact, Sammy threatens to fire Al unless he comes up with some especially clever and unusual material for that show. The Blackwell Story Feb 28, 1957 A drama about the numerous obstacles faced by a young student who is intent on becoming the first woman doctor in the United States. Set in the late 1830's, the program examined her dedication, her love interests, and her efforts to modernize antiquated O.R. procedures which she feels are life-threatening. Invitation to a Gunfighter Mar 7, 1957 Hugh O'Brian is a gunfighter terrorizing a small western town. The townspeople finally pool their money to a hire another gunfighter (Gilbert Roland) to drive O'Brian out of town (which he does).But, if the townsfolk thought they had it bad when O'Brian ran the town, that was childsplay next to the reign of terror instituted when Roland takes over.Finally, they have to pool their money again, this time to hire O'Brian to get rid of Gilbert Roland.A wonderful dramatization of the old adage, ""Be careful what you ask for; you may get it."" The Last Tycoon Mar 14, 1957 Monroe Stahr heads a movie studio apparently headed for financial trouble. He is under pressure from the stockholders to produce a box-office hit. While he turns his attention to their latest film, he finds that financial expert Lou Myrick will play a crucial role in his business as well as in his personal life. Clipper Ship Apr 4, 1957 A romance on the high seas revolving around the comely widow of a shpping magnate, and her growing love for a handsome young political prisoner who was scheduled to be put to death when the vessel reached its destination. Though unyielding at first, the ship's stern captain eventually helped the woman to make a clean getaway, with the condemned man in tow. Homeward Borne May 9, 1957 A drama of a refugee orphan, who was both wanted and unwanted in the family of a returning war hero. The wife fought against her own happiness to take in the orphan. To the orphan, the husband is a killer of his people and resentment burns deep. The husband is equally inflamed against the orphan and is determined he must go. It becomes a family divided, but ends when scorn turns to love. Without Incident Jun 6, 1957 Captain Russell Bidlack, commander of a U.S. Cavalry unit in 1870, determines to complete a rescue mission through dangerous Indian territoy. In the course of the mission, he rescues the wives of two slain traders and captures the Indian chief accused of the murders. When he returns to the fort, he's faced with a revolt among his own men.